Lawson Adventure Park & Resort is one of the most unique accommodations in the state. 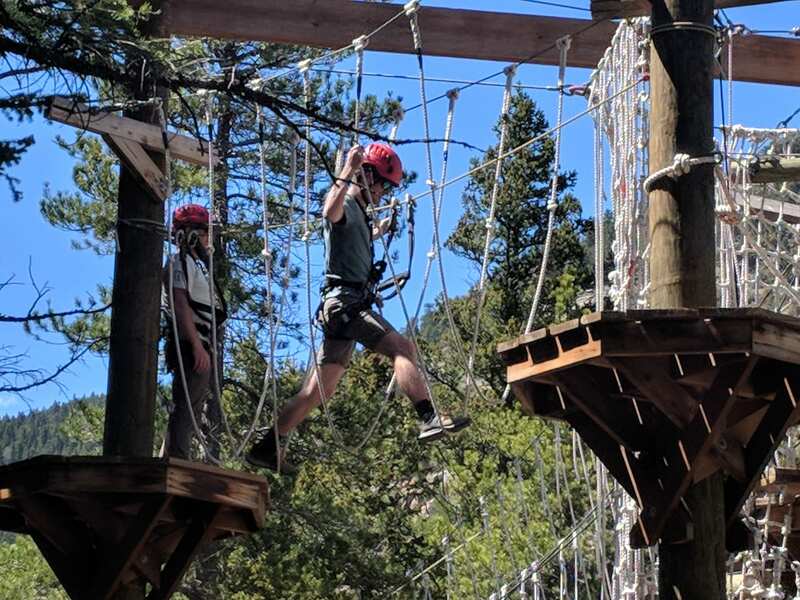 On top of 13 different lodging options they offer 12 different activities to make your summer amazing. It’s conveniently located right off Highway 70 in Dumont near Empire. There are several restaurants nearby, as well as markets. Lawson Adventure Park has a full bar too in their main check-in cabin. The following summer activities are offered from late May through mid August. They combine a number of their activities in exciting Adventure Packages. 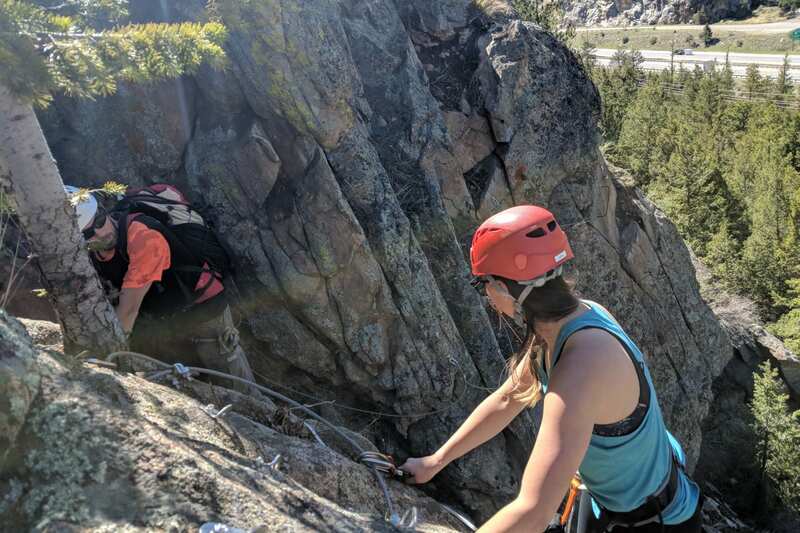 Via Ferrata – Experience this unique rock climbing excursion on Colorado’s only private via ferrata. The adventure begins at more than 8,200 feet and is designed on native rock. 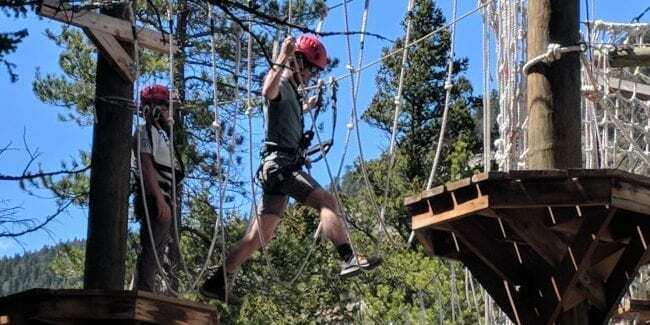 Zip Line – Dual zip lines make this am exhilarating way to see the forest from above. 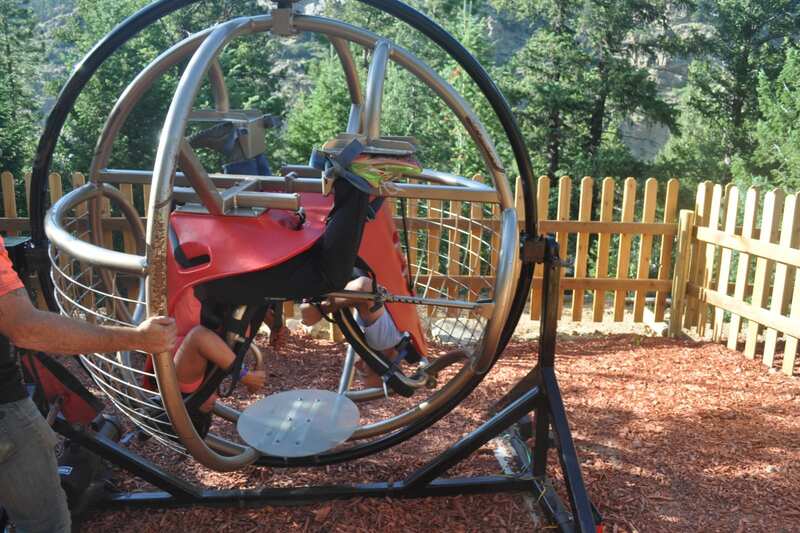 Zorb – This is the only place in the state where you can ride a Zorb down a mountain track. Bounce down the hill on the 9 foot Zorb that’s filled with 5 gallons of water, offering a wildly refreshing thrill. Aerial Challenge Course – There are 8 unique obstacles awaiting guests above the treetops in this aerial course. Mechanical Bull – Try your luck at the mechanical bull and see if you can ride it like a professional. Water Walkerz – Hop inside the Water Walkerz and feel the unnatural sensation of walking on water. Climbing Wall – This 3 story climbing wall has 4 different surfaces, so rock climbers of all levels can test themselves and learn new techniques. Gyro Extreme – Train like a fighter pilot on NASA astronaut in the Gyro Extreme. Disc Golf – Compete against the whole family on this wooded 18-hole disc golf course. You “tee off” by throwing a frisbee toward a basket. The fewest number of tosses to land in the basket wins. Fly Fishing on Clear Creek – Learn to fly fish with knowledgable guides and look hook that trophy trout. Bungee Trampoline – Donning a harness, jumpers bounce to almost 3 stories high on the trampoline. River Rafting – They’re rafting partners provide safe and scenic river rafts down the nearby Clear Creek. Both the cabins and yurts are rentable year round. All cabins and yurts are smoke free, tobacco and marijuana, except for the 8420 yurt. 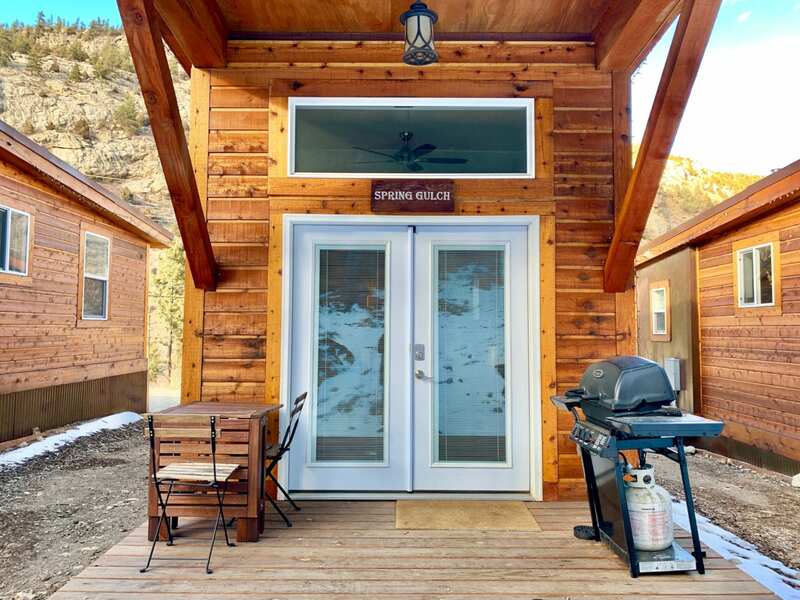 Cabins – There are 7 one bedroom tiny home cabins, and 1 two bedroom cabin available. 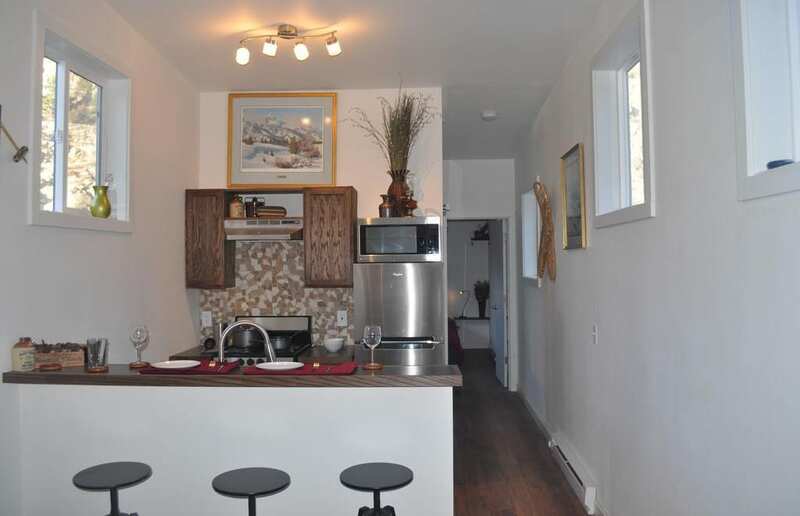 They are modern, yet rustic feeling, each with a full kitchen, living room and patio. They range from 400 to 600 square feet each and provide numerous windows for natural light. BBQs are provided on the patios. 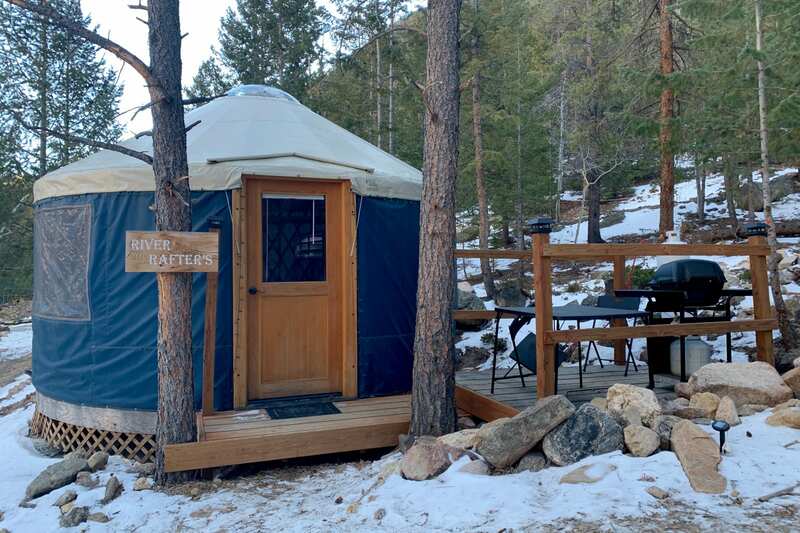 Yurts – 5 fully furnished sixteen foot yurt rentals are available. They can house a family of four, complete with beds and sofa. Yurts share a common bathhouse with showers and bathroom facilities. Each has amazing scenery surrounding them. While they don’t have electricity or running water, they do offer gas-powered heating for the winter. They also have decks with propane BBQs. A lantern is the light source, so you may bring an additional flashlight or two. Campsites – Campsites are available during the summer. Stargaze while sitting out by the roaring campfire.